Most fans of the spectacular tropical drinks at The Mai-Kai in Fort Lauderdale are content with the current 47 cocktails, a majority of them classic concoctions that have withstood the test of time for 60 years. But The Atomic Grog can’t get enough of The Mai-Kai, so like to crank up our flux capacitor and go back in time to dig up a few “lost cocktails” that disappeared from the menu over the years. Consider this the advanced level of the Okole Maluna Society, our cocktail guide that includes reviews and recipes of every current drink and a few long-lost classics. 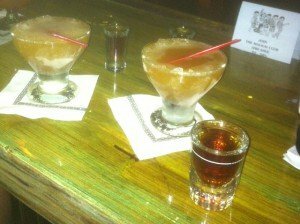 When the Demerara Cocktail came out of retirement in August 2012, it gave us the inspiration to dig deeper into the history and explore some of the other long-gone drinks. Here’s the cool part: They’re not really long gone. The old recipes are still kept in owner Dave Levy’s office, safely under lock and key. Levy is the stepson of founder Bob Thornton, and keeper of most of the remaining cocktail secrets. So after the return of the Demerara Cocktail, the next logical step was to revisit its sister drink, the Demerara Float. It took more than six months, but our wish was granted unexpectedly in early in 2013, when the photo above popped up on the Facebook news feed of The Hukilau organizer Christie “Tiki Kiliki” White. It looked like a Shark Bite with its Appleton rum floater. But this was no Shark Bite. The rum was noticeably darker. Could it be? Indeed it was, and we rushed down to The Molokai bar the next evening to taste this lost classic, which likely was removed from the menu during the 1980s or early 1990s, when 151 Demerara rum became hard to find. 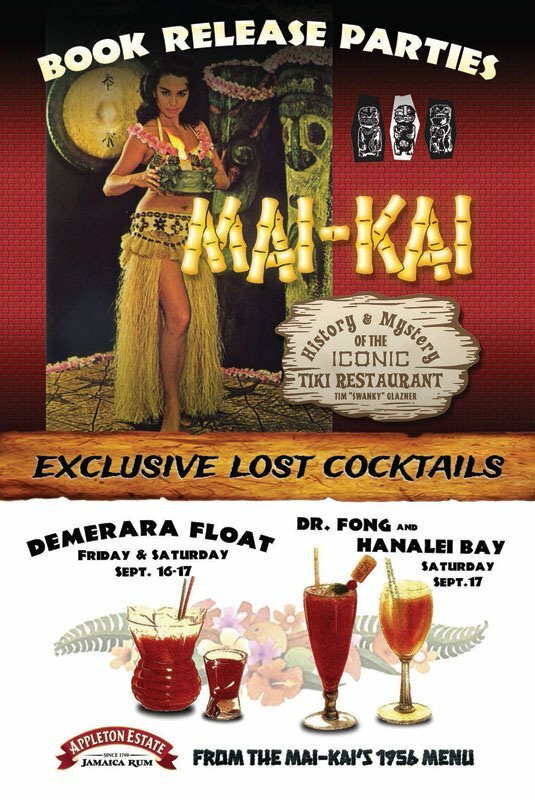 Its return in May 2012 not only re-energized some of The Mai-Kai’s best drinks, it made the return of the Demerara Float possible. 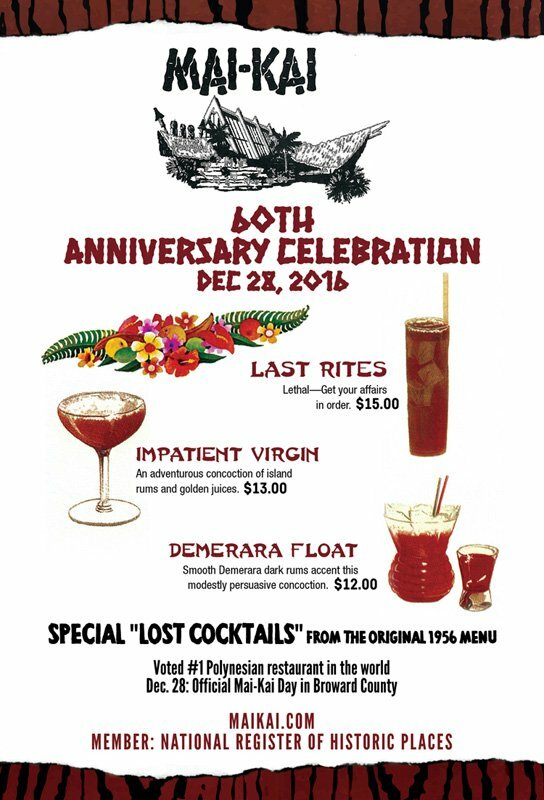 The Demerara Float has the same lineage as many others that have endured on The Mai-Kai’s menu for the past half-century. The first ancestor recipe below, of course, is the handiwork of Tiki cocktail pioneer Donn Beach (aka Don the Beachcomber), who set up shop in Hollywood, Calif., the day Prohibition ended in 1933 and went on to influence the next half-century of tropical mixology. 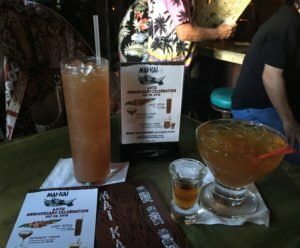 (Click here for the full history and ancestry of all The Mai-Kai’s cocktails.) Beach was so far ahead of his time that he’s just now being fully appreciated by a new generation of craft cocktail enthusiasts. 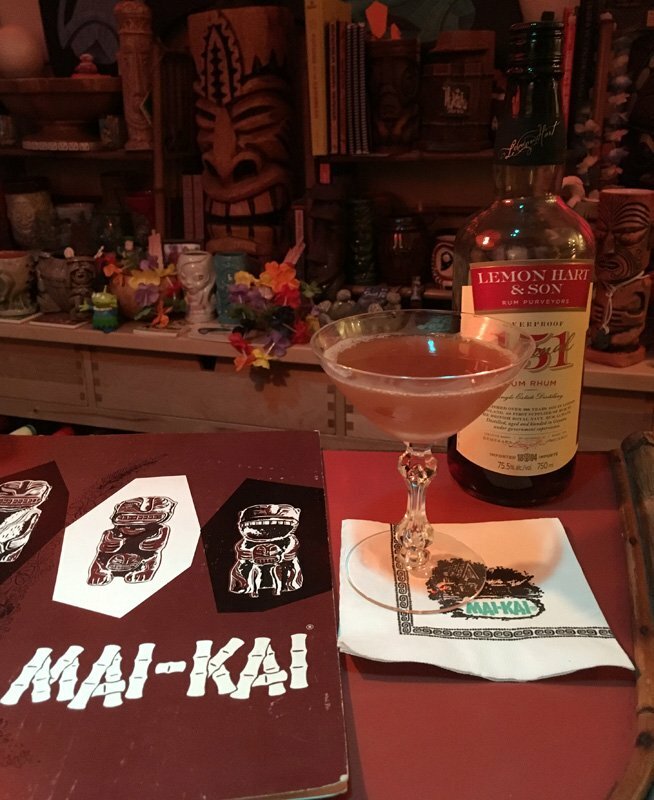 The Mai-Kai’s head mixologist from 1956 until 1979 was a Don the Beachcomber disciple, Mariano Licudine, who created his vast menu by retooling and renaming many of Beach’s best drinks, and also adding a few of his own. A recently discovered Licudine recipe is featured below, along with my own “tribute” recipe that approximates the recent revived version. 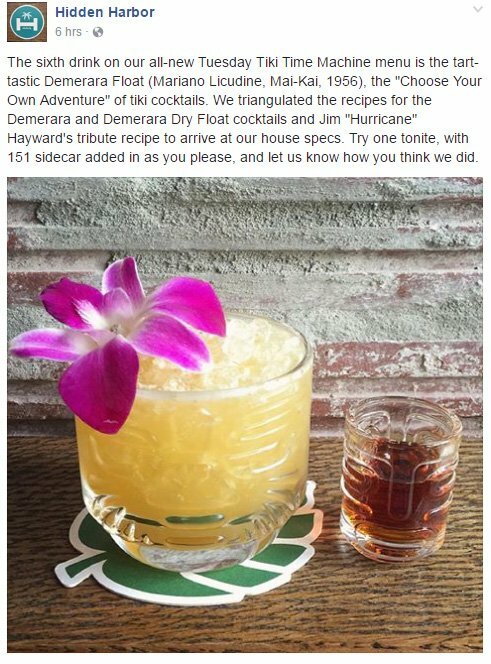 Since its grand 2013 return, the Demerara Float has made repeated appearances, including a “lost Cocktails party” at The Hukilau in June 2013 (see photo), the September 2016 book release party for Tim “Swanky” Glazner’s Mai-Kai: History and Mystery of the Iconic Tiki Restaurant (see the special menu) and the 60th anniversary party in December 2016 (see menu). And when The Mai-Kai kicked off its “Flashback Friday” promotion, it was the second drink featured in May 2017. Flavor profile: Funky and flavorful rums, lime, a hint of passion fruit. 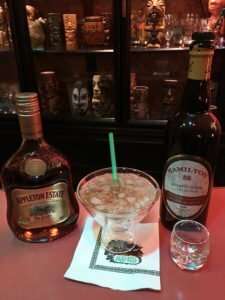 Review: Served in the same size glass but a bit more rummy than the Demerara Cocktail, thanks to a richer Jamaican rum base and a float of Demerara. It’s dry yet sweet with enough tart fruit flavors to keep everything in perfect balance. Rating: 4.5 out of 5 stars (see how it ranks). If it were on today’s menu, it would be near the top of our rankings, easily in the Top 5. 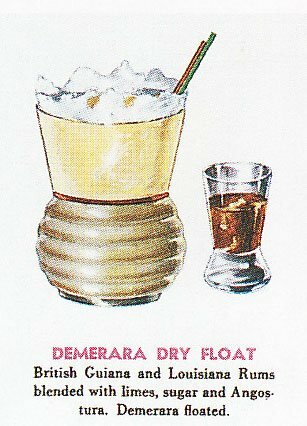 Ancestry: A direct descendant of Don the Beachcomber’s Demerara Dry Float, it was on the original 1956-57 Mai-Kai cocktail menu but likely removed when Demerara rum became difficult to stock and was removed from The Mai-Kai’s menu in the early ’90s. Shake everything – except 151 rum – with ice cubes. Strain into a double old-fashioned glass filled with crushed ice. Carefully float 151. Do not stir. By Don the Beachcomber, circa 1941. Very similar to Donn Beach’s more stripped-down Demerara Cocktail (and containing many of the same ingredients), this drink is sour and dry – as advertised. But in the Don the Beachcomber tradition, there’s great balance and complexity. It’s also sweet and smoky, thanks to the Demerara rum and passion fruit syrup. 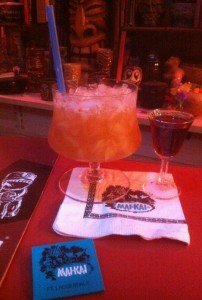 In addition, the juices and maraschino liqueur add a nice tart counterpoint to the rums and sweet syrups. Lemon Hart rum was likely Don the Beachcomber’s go-to 151 Demerara rum, and the recent return of the Lemon Hart 151 to the U.S. market once again makes this vintage version possible. There are many standard-proof Demerara rum options, including those by El Dorado (try the 8-year-old and 12-year-old blends) as well as Hamilton 86 from Guyana. Fresh-squeezed juices are essential, along with a quality passion fruit syrup. You can find recipes to make your own online and in Beachbum Berry’s books, or order from some of the many small-batch syrup purveyors (most notably Aunty Lilikoi, B.G. Reynolds and Small Hand Foods). Among the more commercial brands, we like Monin and Finest Call the best. Mix ingredients (except 151 rum) with cracked ice and strain into a cocktail or sour glass. Float 151 rum. This recently discovered recipe from a vintage Lemon Hart Rum cocktail book says it was “created at the Mai-Kai Polynesian Restaurant, Ft. Lauderdale, Florida.” [See recipe] We don’t doubt it, since Mr. 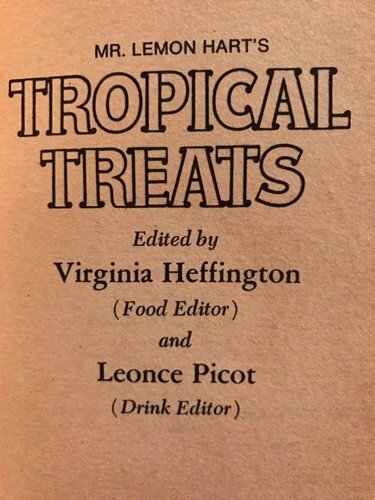 Lemon Hart’s Tropical Treats was edited by Leonce Picot, an assistant manager at The Mai-Kai from 1957 until 1967. 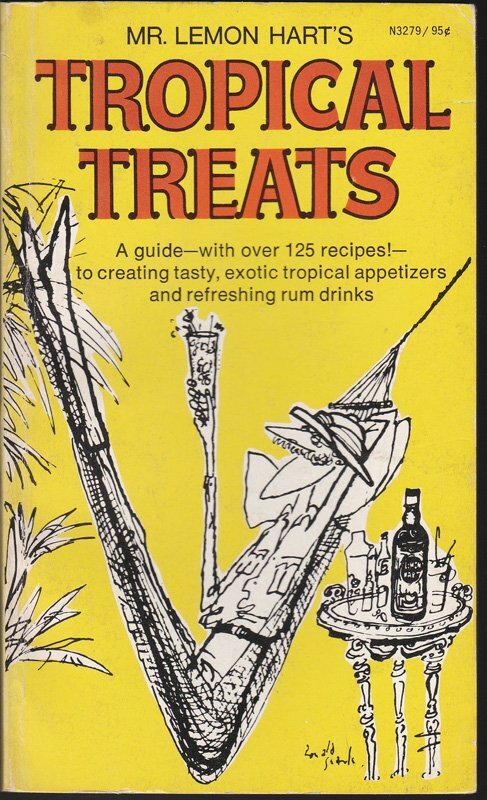 The same book also includes a Demerara Cocktai recipe that was published in Beachbum Berry’s Sippin’ Safari. And, like that sister recipe, the Lemon Hart version appears to be scaled down to half-size, though it’s possible it may have appeared as a small sipper at some point on The Mai-Kai menu. We prepared it in this fashion above, but feel free to double the proportions for a more hefty grog. The Mai-Kai’s vintage menu artwork appears to show a larger version. This recipe also doesn’t list the amount of 151 rum to be floated, but 3/4 ounce seems to work best. 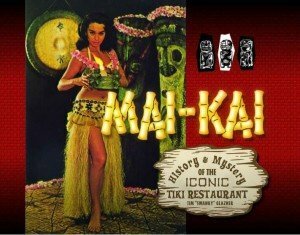 Picot was a key member of The Mai-Kai’s early management team, credited with helping conceive and launch the Mystery Drink, according to Mai-Kai: History and Mystery of the Iconic Tiki Restaurant. In 2011, author Tim “Swanky” Glazner interviewed Picot, who still lives in South Florida, about his role in the creation of the iconic drink. While still at The Mai-Kai, Picot edited a series of books spotlighting restaurants and recipes from around the world, Glazner recently told us. The books – including Gourmet International’s Recommended Restaurants of Puerto Rico (1961) and Great Restaurants of the United States and Their Recipes (1966) – were financed by The Mai-Kai’s owners, Bob and Jack Thornton, Glazner said. 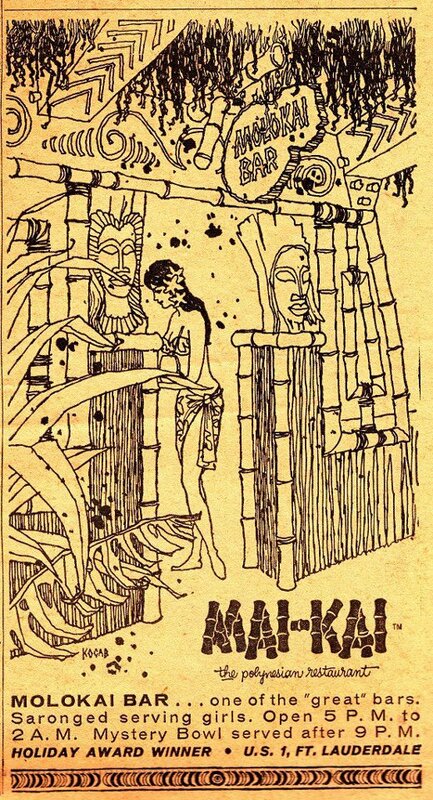 The books were illustrated by Al Kocab, known for his distinctive artwork for The Mai-Kai (see image). The Demerara Float was featured during the Tim “Swanky” Glazner’s book release parties in September 2016. Picot was also the Southeast manager of Rums of Puerto Rico, Glazner said. He left The Mai-Kai in 1967 to open the Downunder, which also had recipes in the Lemon Hart book. Picot was “drink editor” of Mr. Lemon Hart’s Tropical Treats, a paperback that includes more than 125 food and rum cocktail recipes, selling for a mere 95 cents in 1973. Good luck finding it at that price today. Used copies fetch more than $50 on Amazon. Note that the cover art was the work of noted British artist Ronald Searle, who illustrated Lemon Hart ad campaigns in the 1950s (see story and more artwork). This version of the Demerara Float is a very potent and dry strong sipper that serves as a great showcase for Demerara rums, Lemon Hart or otherwise. Break it down and it’s just a souped-up Daiquiri. But one of the best Daiquiris you’ll ever taste. In the tradition of the classic Daiquiri, I used raw organic sugar instead of a simple syrup, diluting it in the fresh-squeezed lime juice before mixing. I suspect that Lucidine and The Mai-Kai made this drink differently in the bar, the provided a simplified version for the Lemon Hart company’s book. But it’s actually not far off what we can taste today (see tribute recipe below). Also, in The Mai-Kai tradition, we mixed this up in a small pulse-blender instead of shaking like you would a typical Daiquiri. The Mai-Kai uses no shakers whatsoever, strictly following Don the Beachcomber’s creed of pulse-blending. It works well here, the cracked or crushed ice diluting the strong flavors when poured through a strainer. The rums are the key to this cocktail, so try to stick with Lemon Hart 151 (or Hamilton 151, which is very similar) as the floater. 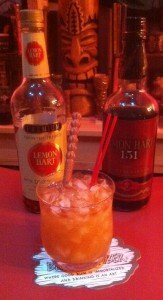 Click here for the full story of the recent history Lemon Hart and Hamilton rums at The Mai-Kai. See our standard Demerara rum recommendations above. If you live in the United Kingdom, you have even more options for sweet and smoky Demerara rums than the U.S. market (Wood’s and OVD, among others). Your choices of gold Puerto Rican rums are many, from an aged Bacardi (8-year, Select, Anejo) and Don Q (Anejo), to Ron del Barrilito (2 Star and 3 Star). Simliar Spanish-style gold rums can be found in the Virgin Islands (Cruzan), Nicaragua (Flor de Cana), and the Dominican Republic (Ron Barcelo). The great rums from Cuba are also widely available outside the U.S. (and hopefully here soon). Pulse blend everything – except Demerara rum – with 1/2 cup of crushed ice in a spindle mixer for 6-8 seconds. Pour into a chilled cocktail or specialty glass. Float Demerara rum. For a truly authentic experience, strain into a glass with a pre-made ice shell (see details below). Dry yet sweet, with a potent rum combination of rich and dark Jamaican and Demerara rums. There’s still enough fruit and tart flavors to keep everything in perfect balance. Very similar to the Demerara Cocktail, the only differences are a little less sweetness and slightly more rum (along with a darker Jamaican rum). Second-generation Mai-Kai general manager Kern Mattei told us that the Demerara Float is very similar to the Demerara Cocktail with a few ingredients “switched up” just a bit. The Demerara Float has become our favorite of all the lost cocktails. All the components meld perfectly, with the result a very smooth and not-too-strong medium drink, similar to the Shark Bite. 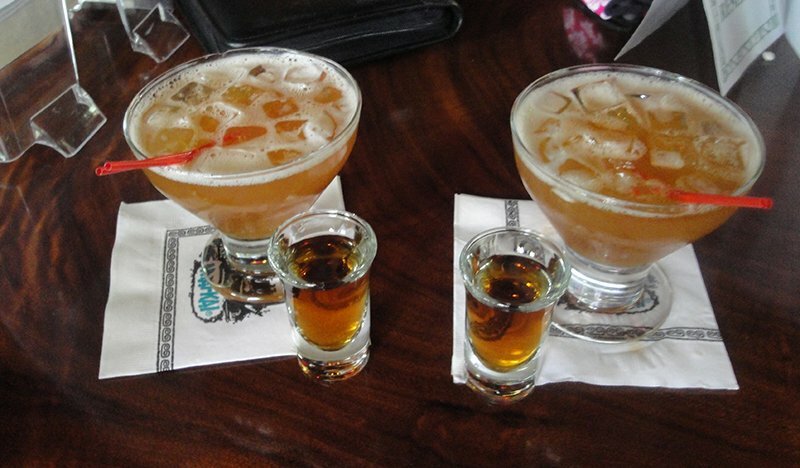 Not coincidentally, both are served in the same glass with the same ice feature and a floater on the side. 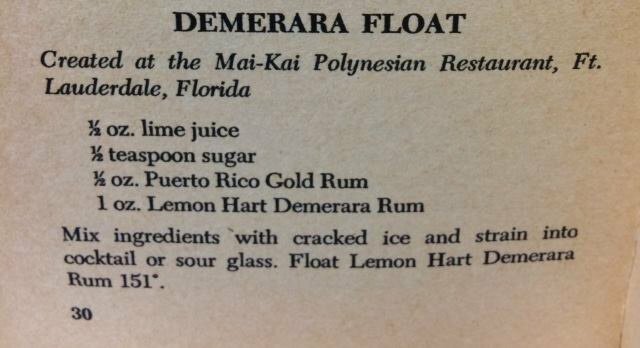 Until recently, we were convinced that the Demerara Float featured a floater of 151 Demerara rum, just as it did in the 1970s-era recipe published in the Lemon Hart book and shown above. In our initial tastings when this drink came in of the vault for special events, the only major difference we noted was passion fruit syrup added to the mix, so we posted version 1 of this tribute (see recipe below). In fact, 151 rum may have been mistakenly served this way at one or more of the special events, manager Kern Mattei says, but the correct recipe uses a lower proof rum. We’ve updated our tribute recipe to account for the different rum in the float, but you can still find our earlier version below. * The floater may not be 151, but the Demerara rum called for in the current recipe is no slouch. Hamilton 86, which at 86 proof is bolder and more potent than many other Demrara rums on the market, is The Mai-Kai’s only option in all drinks that call for a non-151 Demerara rum. If you can’t find Hamilton 86 in your area, seek out another dark and flavorful Demerara rum such as the El Dorado products from Demerara Distillers. The 8-, 12- and 15-year-old rums from El Dorado are all fine choices. Outside of the United States, there may be even more choices (see notes above), but all Demerara rums come from that same distillery, the only one left in Guyana. This includes Lemon Hart, which is back on the U.S. market with a new 80-proof rum called Orignal 1804. 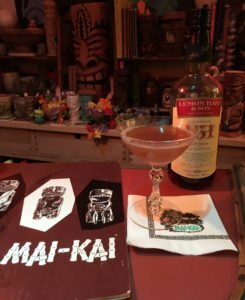 The Mai-Kai had been using both 151 and 80-proof Lemon Hart until early 2015, when they were temporarlily removed from the U.S. market. Hamilton (86 and 151) was the replacement, and these rums indeed come very close to the flavor profile of Lemon Hart. In mid-2016, Lemon Hart 151 returned, and The Mai-Kai went back to using it as the 151 Demerara while keeping Hamilton as the standard Demerara in all the cocktails. Confused? I don’t blame you. See our full story on Demerara rums at The Mai-Kai for more on the rich history of these rums. * I’ve always noted the distinct flavor of Jamaican rum in The Mai-Kai’s latest version of the Demerara Float, so I initially went with Appleton Special gold as a nice supplement to the 151 floater (see version 2 below). But there was something missing. The lighter gold rum worked well with the 151, but when I retooled the recipe to feature the Hamilton 86 float it was lacking flavor. So I stepped up the Jamaican rum to a darker variety. 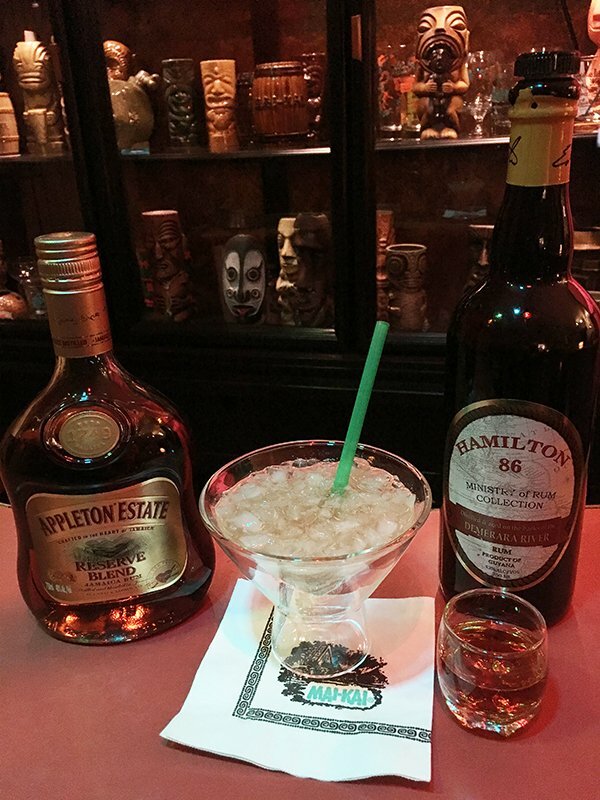 Currently, The Mai-Kai uses Appleton Estate Reserve Blend as the standard dark Jamaican rum, and this works perfectly here to approximate the flavors you’ll currently find in this cocktail. This delicioius combination of Demerara and dark Jamaican rums is a hallmark of not only The Mai-Kai, but Don the Beachcomber as well. Think of the Zombie, the 151 Swizzle and many others that feature this combination. Until recently, the rare and flavorful Kohala Bay was the standard dark Jamaican rum (an ancestor of the legendary Dagger brand used by both Don the Beachcomber and The Mai-Kai). If you want to punch up this drink, just upgrade to one of our suggested Kohala Bay substitues listed here. 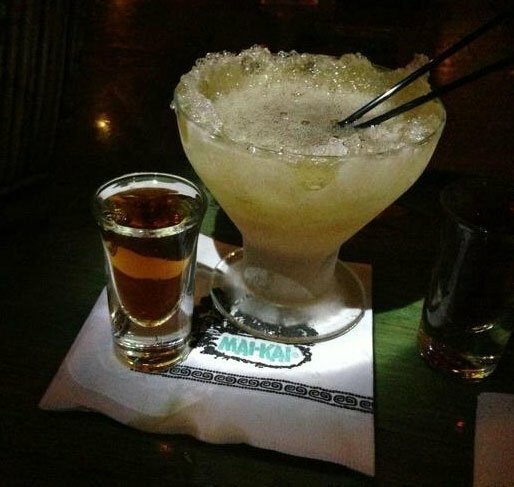 * The Mai-Kai’s lime juice is distinct, a tart blend of key lime and fresh persian lime juice. It elevates this drink by matching the bold flavors of the rum and syrup. 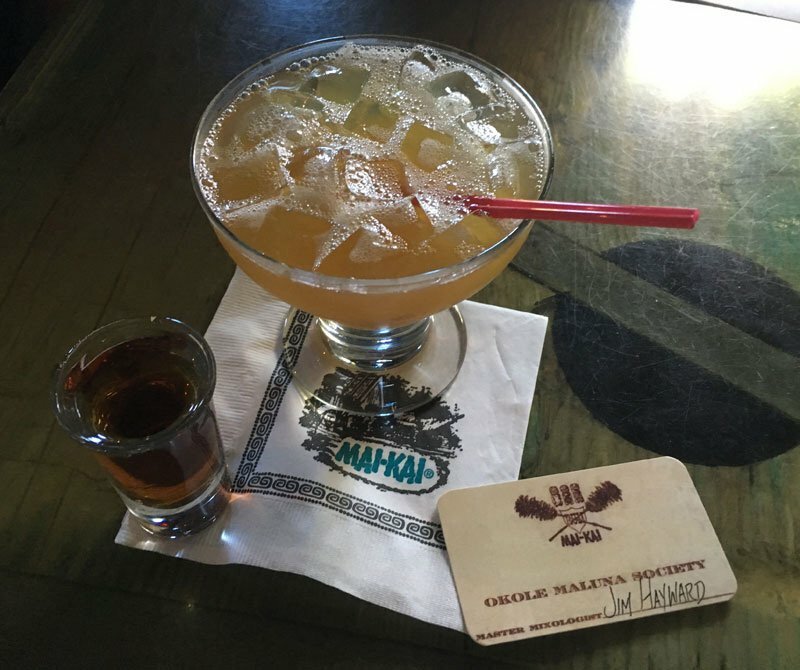 See our in-depth look at the juices used at The Mai-Kai on Tiki Central. Be sure to use a rich and flavorful passion fruit syrup, either homemade (like The Mai-Kai) or a product from one of the many small-batch manufacturers (see above). For lovers of Demerara rum, this resurrected classic cocktail is an essential addition to your repertoire. To show the evolution of the tribute recipes, we’re including the first two versions below. Version 1 was created after the Demera Float was rolled out at special events in 2013 and featured until May 2017, when the retooled version 2 was posted. The original version (posted when this review went up in 2012) was my take on what I thought Mariano Licudine may have created based on Don the Beachcomber’s 1941 recipe above. It may be overly complex compated to the others, but it’s tasty nontheless. Pulse blend everything – except 151 rum – with 1/2 cup of crushed ice in a spindle mixer for 6-8 seconds. Strain into a chilled cocktail or a specialty glass with ice shell. Float 151 rum. * The ice shell is a Mai-Kai trademark used in many cocktails, from the elaborate Special Reserve Daiquiri and Gardenia Lei to more modest Tahitian Breeze. For the Demerara Float, we followed a similar style to the Demerara Cocktail as well as the long-running classic Shark Bite. Those in the know also enjoy the ice feature in the off-menu Zula #2. 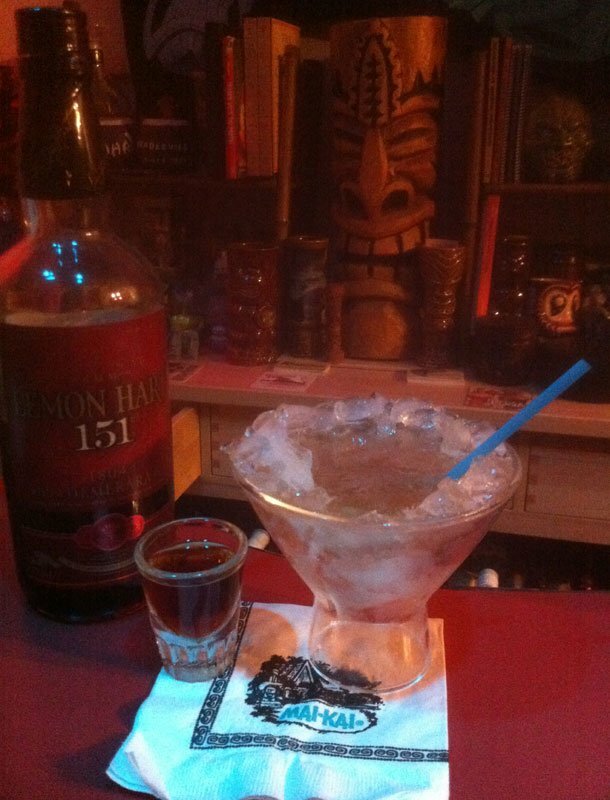 Shake everything – except 151 rum – with ice cubes. Strain into a double old-fashioned or specialty glass filled with crushed ice. Float 151. Do not stir. 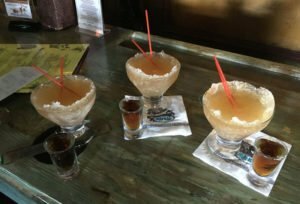 If you’re ever in Pittsburgh, be sure to check out this modern Tiki bar with great cocktails and an appreciation for the classics as well as inventive new originals. This entry was posted in Cocktail reviews, Cocktails, Cocktails, Culture, History, History, Mai-Kai, Recipes, Rum and tagged 151 rum, Appleton, Beachbum Berry, daiquiri, Dave Levy, Demerara Dry Float, Demerara Float, Demerara rum, Don The Beachcomber, Hidden Harbor, Hukilau, Lemon Hart, Mai-Kai, Mai-Kai: History and Mystery of The Iconic Tiki Restaurant, Mariano Licudine, recipe, rum, Swanky, Tiki Kiliki. Bookmark the permalink. All these recipes missing from remixed, I need copies of grog log and intoxica. If only they were digital! Looks great as always man. You research is a boon to all of us tikiphiles out there. That Lemon Hart book? Check the author. Leonce Picot is the author of mine. Swanky: I’ll make sure Leonce gets credit as drink editor (a worthy title that I definitely aspire to). Okole maluna!